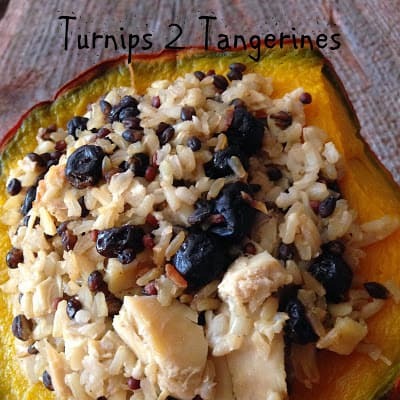 Brown Rice Medley, Blueberry and Chicken are mixed together, then piled high in a red hubbard or acorn squash half. 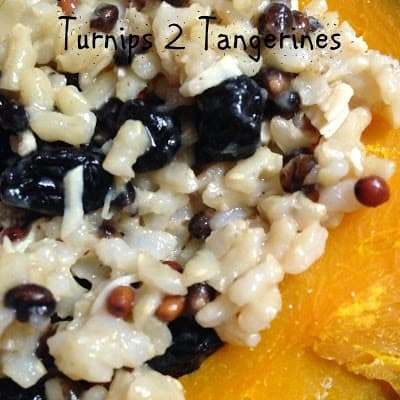 This recipe is tasty, rustic and hearty. 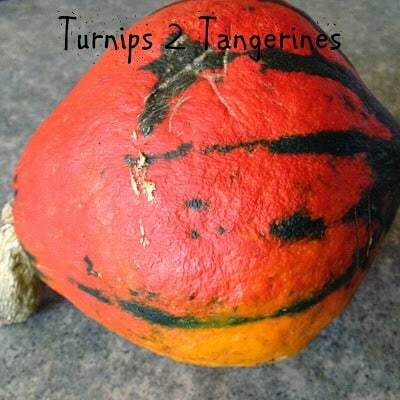 It combines the seasons bounty for the perfect fall meal. Made easy with brown rice medley, which is a combination of several rice and grains. Dried blueberries add sweetness and are a nice change from dried cranberries or cherries. I love this time of year. Fresh fruits and vegetables abound. I always feel inspired this time of year, inspired to cook and/or to bake fresh vegetables and fruits in new and delicious ways. This recipe happens to be a favorite of ours. It’s perfect for lunch or supper and the left-overs are fantastic too. 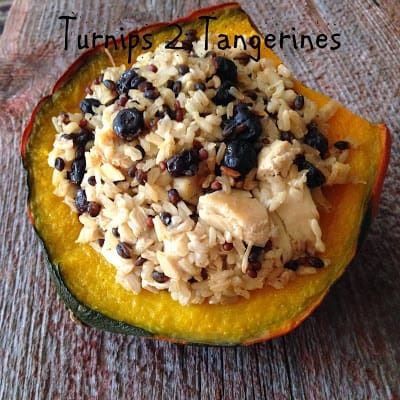 Brown Rice Medley, Chicken and Dried Blueberries blend wonderfully with Squash. You can double or triple this recipe with the same great results. For this recipe, we used a brown rice medley that we purchased at Trader Joe’s. You can use any brown rice medley that you like or you can use a wild rice medley or even plain brown/white rice. There are several different brands on the market, so purchase any brand that you and your family likes. It’s been my experience that most families have their favorite products, so stay with what you know and like, I always say. You can leave the chicken out for a meatless meal and your favorite wild rice blend can be substituted for the brown rice medley. You can substitute dried cranberries or cherries for the dried blueberries. Wash squash, cut squash in half. Remove and discard loose fibers and seeds. Prick inside of each squash half with a fork. Sprinkle inside with salt and onion powder. Place squash in a 13 x 9- inch baking dish; add 1/2 inch water. Bake, uncovered at 350º for 45 minutes. In a large saucepan, bring water and bouillon cube to a boil. Add butter and brown rice medley. Bring back to a boil. Reduce heat and simmer, covered for 35 minutes. Remove from stove, let rest covered 10 minutes. In a medium skillet, heat oil over medium heat. Add shallot and garlic, saute for 3 to 5 minutes. Add chicken, chicken broth and poultry seasoning. Cook and stir for 5 to 7 minutes or until most of the liquid has evaporated. Remove from heat, stir in rice mixture. Stir in dried blueberries or cranberries. Remove squash from oven. Fill inside of squash with rice mixture. Cover loosely with foil. 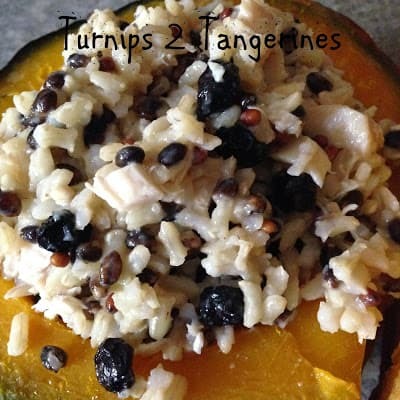 Bake an additional 30 minutes or until squash is tender. Looking for more Autumn inspired recipes?? Northwoods Duck Gumbo and Slow Cooker Hungarian Goulash are two recipes that are true comfort foods. Delicious and comforting with a down-home taste that can’t be beat. We are just starting to get sqash. Pinned this for next month. Thanks for bringing this by Weekend Bites. I love the rice meledy from TJ's which is also where I buy my dried blueberries! Looks delicious! This looks so yummy! It just sings fall & isn't that what it is all about right now? Eating seasonably! I am pinning! Can't wait to try it! Thank you for sharing this fabulous recipe on our our recipe and DIY link party #PureBlogLove… We will be sharing it across our social media today! I can't wait to see what you have instore for us next weekend! Party starts at 8 pm est Thursday and runs ALL weekend long till Sunday at midnight.